Benz Micro cartridges have been in production since the 1980s, earning recognition throughout the world as one the top brands in the field. Ernst Benz, founder and designer of the original Benz-Micro cartridges, retired in 1994 and sold the cartridge production to Albert Lukaschek, his close associate and designer of the Benz-Micro PP-1 phono stage. Albert relocated and modernized the factory, employed a highly skilled workforce, introduced many new models, including the ACE which we are looking at here. Though best known among audiophiles as a cartridge designer and manufacturer, Ernst Benz was also a well respected watch designer. He also developed and manufactured a high temperature vacuum oven for bonding diamond to steel that resulted in a line of diamond cutting tools. Hand-building a phono cartridge is a highly developed skill, requiring specially trained technicians working with microscopes and ultra small-scale manufacturing. A competitive global business environment and technically demanding jobs have made finding skilled workers a major concern. On-going changes in the Swiss workforce, including the growth of both the high-end watch industry and high tech, have reduced the pool of these skilled technicians and the potential for new trainees. Benz Micro’s current production team represents the best of the best for producing state-of-the-art phono cartridges. These changes in the labour force, combined with further advances in design and materials, have resulted in new Benz-Micro models that surpass all previous versions in music reproduction. The Swiss pedigree is obvious from the packaging and accompanying accessories alone, which include a circular bubble level and stainless miniature screwdriver. Albert Lukaschek listens to every Benz Ace cartridge before it leaves the factory ensuring that they all meet the high level of sound quality he demands. Dashing in its red livery. To describe it as both warm and neutral might sound contradictory but that’s exactly what it is. There is never a sense of “character”. The Benz micro is a pure musical tool; it delivers exactly what the record intends, whether it is life and propulsion or calm and introspection and without even a hint of harshness. Instruments are portrayed realistically and with occasional surprise; sounds sometimes leap out that you wouldn’t expect, giving that spine tingling sensation. This is a true music lover's cartridge, warm and natural through the mid-range, with great bass extension and silky smooth high frequencies. If you just want to play record after record with a big smile on your face...the ACE is the cartridge for you. Fitted to A Michell Techno “a” Arm” ready to play! The Benz Micro SL MC Cartridge is available from all branches of Audio T.
OK, so you either you bought yourself or you’ve been gifted that lovely new turntable and you’ve been busy buying up lots of lovely new records to play on it. Now what if you discover that your recent purchase is in less than perfect condition? Well you could of course go down the route of buying yourself a dedicated record cleaning machine. The one that we always keep on coming back to is the Project VCS Mk2. Hailing from the same company who are world famous for producing top notch turntables this cleaner is built like a tank and is super easy to both set up and to use! The VCS Mk2 has the remarkable ability of being able to rescue some of the crackliest sounding second hand purchases, making them sound and look like they are fresh out of the shop! Sometimes even brand new and shiny looking LPs can suffer a little from stray clicks and pops caused by specs of dust that have managed to embed themselves deep in the records grooves and here a quick spin on the VCS Mk2 can reap rewards. We have two local second hand record stores who have both invested in this miraculous little machine and both of them swear by it and use them daily! Now what if those dusty records have clogged up your brand new stylus with a little ball of tricky to remove fluff? You need one of these rather nifty little stylus cleaning brushes imaginatively named Clean-it! The brush boasts a pad of short carbon fibres and all you do is run the brush down the cantilever and over the diamond stylus. This will remove dirt deposits and stray fluff from the stylus tip. And remember removing dust, dirt and fluff from the stylus not only prolongs the life of you cartridge but will also improve sound quality and most importantly of all protect your records from wear. And hey…..they are not expensive! Logically it follows that the best way to stop your stylus from fluffing up at all is to give your records a good clean up before playing them. For this very purpose comes the carbon fibre bust that Project call Brush-it. I sense a theme here! This is every vinyl lovers’ essential piece of kit; a brush specially designed to keep your precious vinyl in optimum playing condition, free from atmospheric and residue blemishes. As the record is spinning you simply drag the brush lightly from the inside to the outside and it will drag any dust out with it. It is also genius at reducing static charge in the vinyl too! And talking of reducing static charge I come on to the phenomenon that is the anti static inner sleeve! Our preferred brand is the Nagoaka. Coming in packs of fifty, not only will these prevent the build up of a static charge which can manifest itself as random audible clicks and pops that can interfere with your listening pleasure, they also provide a huge degree of protection from scratch damage when taking records from or putting them back in to those hideous cardboard inner sleeves that most record labels seem to deem adequate protection for their shiny new slices of vinyl (that happens to be one of my pet hates that one!) These sleeves are also an essential item for when you have just given your record a rejuvenating spin on the VCS Mk2 record cleaning machine! Can You Get Excited By A Loudspeaker Stand? SolidSteel Stands To Reason! When their rep turned up at the store with what we thought was just another pair of speaker stands to say we were a little sceptical was a bit of an understatement! When he took our little Acoustic Energy AE100 off their Atacama stands and put on the Solid Steel SS6 the sound was totally transformed. We just looked at each other with open mouths and promptly ordered some! Now they are not what you would call conventional looking stands . They are three legged which makes them really easy to rigidly fix them to your floor. The nice chunky spikes help too! They are made from tubular stainless steel and have a special anti-resonant coating. They have height adjustable spikes and it is possible to add mass loading too for that little bit of extra performance. The really clever bit is the decoupling between the stand and the top plate. This is achieved through three high precision ball bearings upon which the top plate sits and is held in place by a metal tube which itself is de-coupled by a rubber “o” ring…….all very clever! 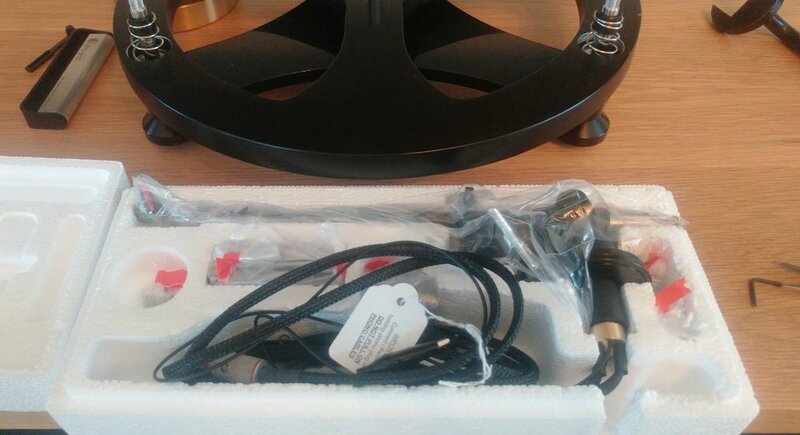 This effectively means that the loudspeaker will be effectively locked rigidly in space which will result in a much cleaner and more open sound. They come in three different heights to suit whatever bookshelf design of loudspeakers you might have. Different top plates are also available for that extra bit of customising to your speakers. Heights available are 525mm, 625mm or 725mm. They are designed to be used with the single column at the rear which Solid Steel claim gives them improved rigidity but if you really prefer the look of them the other way round then ….. hey rules are made to be broken! 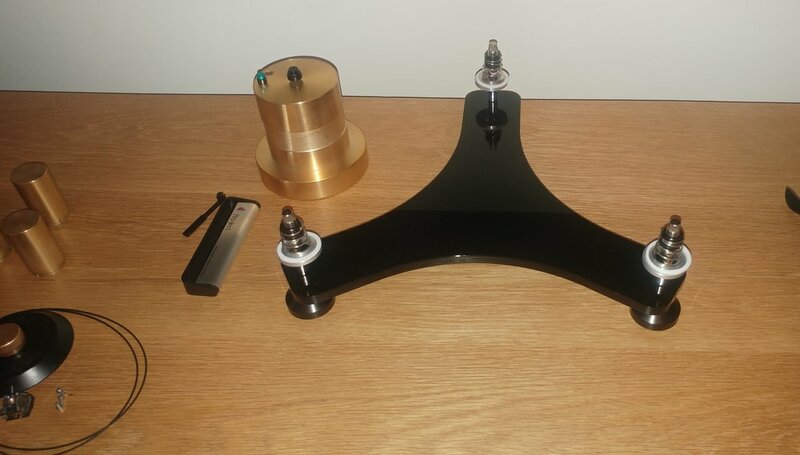 For the purposes of this blog I set up a system comprising of Rega’s rather lovely Planar 3 turntable with an Elys cartridge running into Rega’s Elex R amp (both recent What HiFi award winners by the way!!). 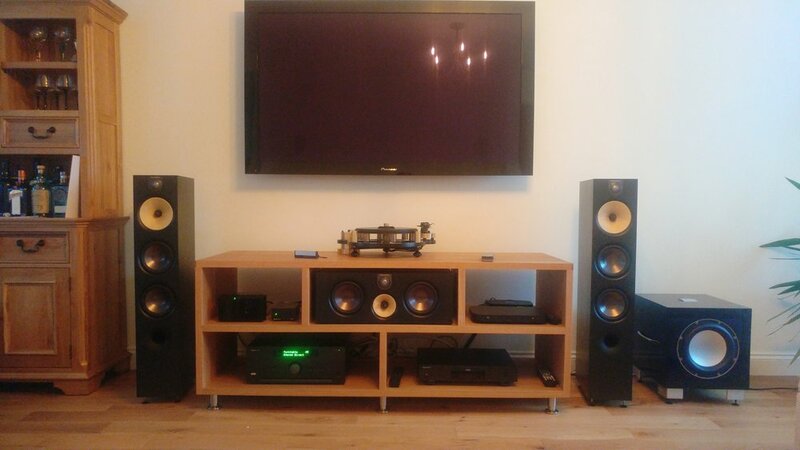 I chose to partner them with the ATC SCM11 loudspeakers and to start with I put them on a pair of the HiFi Racks stands which are no slouches in their own right! I chose an LP that I am familiar with, the rather lovely new album by a band called Lump. Lump basically consists of Laura Marling and Mike Lindsay normally part of the band Tunng. Lump have been described as a heady blend of wonked-out guitars, Moog synths and pattering drums set against droning colliding clouds of flutes with lyrics inspired by early 20th century Surrealism and the absurdist poetry of Edward Lear and Ivor Cutler, slicing through the apparent emptiness of contemporary life. My copy is pressed on lovely translucent green vinyl! This album has some great vocals and wonderful deep low bass and when I swapped the HiFi Racks stands for the Solid Steel stands the difference was just staggering. The bass that was already lush and lovely became deeper and tighter and within the bass was revealed lots of deep growly detail. The mid range became more open revealing tiny vocal nuances that just were not there before. Rhythms clashing and colliding off each other become hypnotic. The ATC really need this type of platform to perform of their best. This result has been repeated in store with every pair of speakers that we put on them making these a must listen to upgrade if you want to get the best out of your bookshelf speakers. Pop in to Audio T Cheltenham store to arrange either a home demo or a demo in store….you will be amazed!! Chromey Has A Sit Down With SolidSteel Stands. 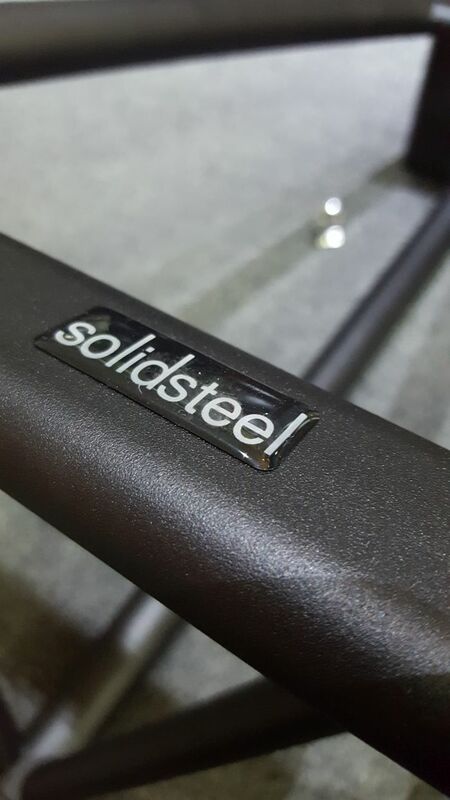 Solid Steel Stands, is one of the oldest Italian brands in the Hi-Fi with 28 years in the business. 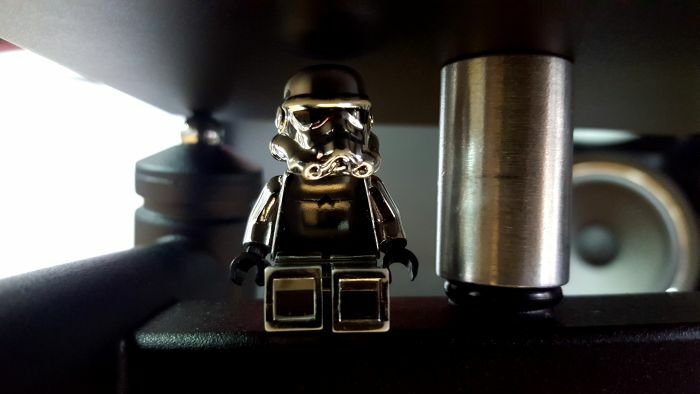 It is very rare that we find a speaker stand interesting enough to decide to blog about, the SolidSteel stands really have caught our attention with their industrial look and charm. Above we have the SS-Vintage stands in black and raw steel. 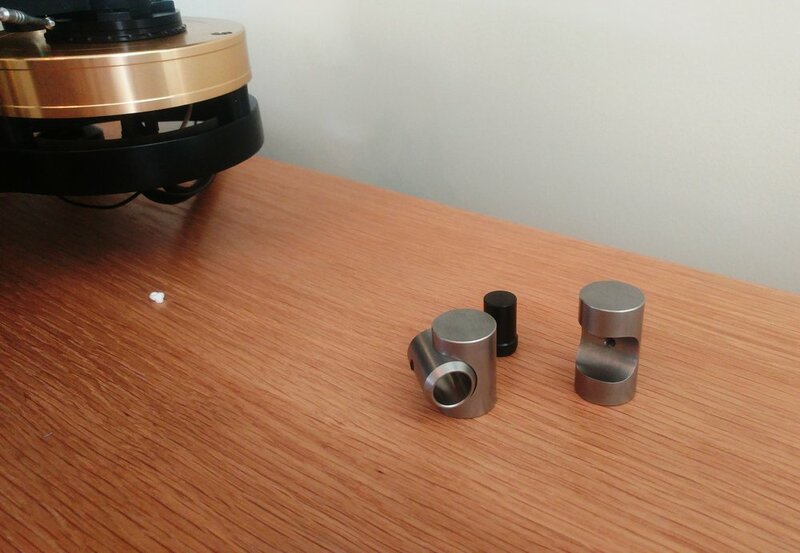 The construction of the stands are of a tripod design, meeting at the top is a base plate, decoupled by mounting perfectly on polished ball bearings on which the speaker sits. The Weld spots are seamless with almost a hint or artistic flare. It is interesting to spare a thought for the time, effort and skill spent to infuse different pieces of metal in such a way that is acoustically isolated and has an artistic element in mind. To hear a significant audible difference in the stands would be no exaggeration, instantly from the offset, bass was tighter and the midrange ever so slightly cleaner. If you want to have a listen and appreciate these stands in the steel (flesh) come along to Audio T Manchester. All the best from the Dave, Mike, Munir, Simon and Haden. We have recently added the new Audioquest Niagara 1000 to our arsenal in store. Filtering noise out of mains supplies is no new thing and we have been championing it for years but this Niagara 1000 is one of the finest examples we have used. It is large and very shiny! 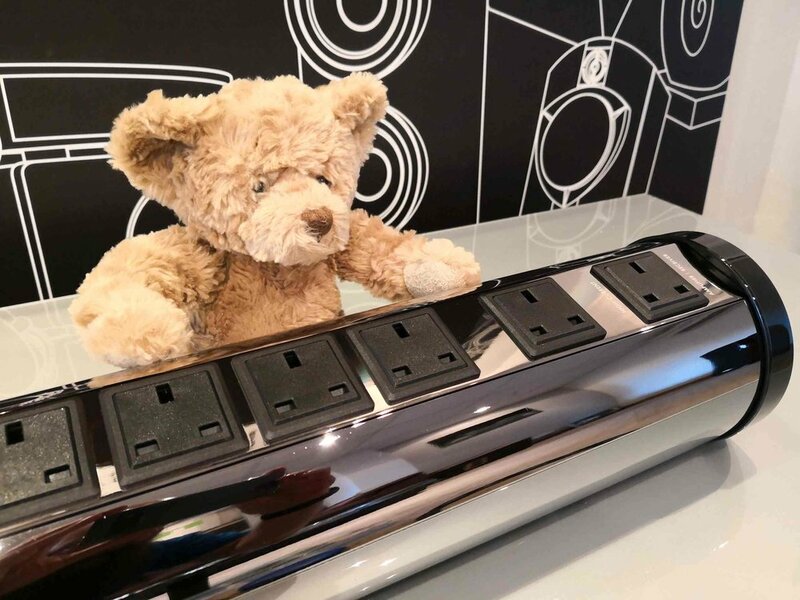 The Niagara 1000 has 5 standard mains outlets and one high current output for hungry devices. An LED lets you know it is operational and there is a red warning LED for over voltage. 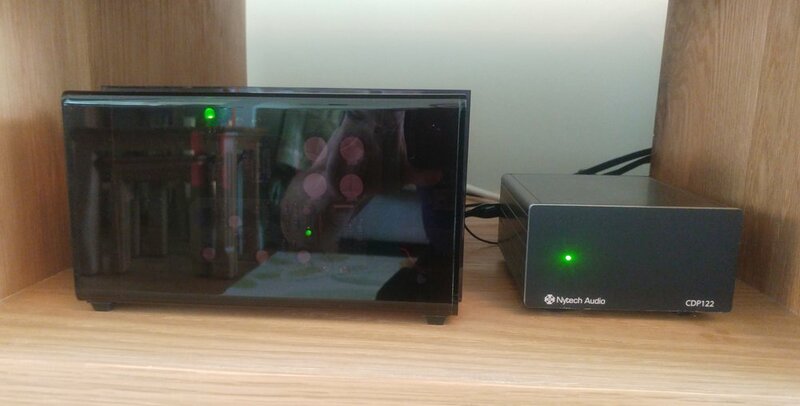 Now there is a lot of technical jargon associated with mains filtering devices (and if you would like to read that have a look at the Audioquest website) but we tend to value our ears and put it to the test with a Rega system comprising Planar 6 with Ania cartridge, Elicit-R, and a pair of B&W 705 speakers. The differences with the Niagara 1000 were marked. There was a much greater sensation of space, coupled with greater dynamics and "quieter quiets" Sarah McLachlan's voice just hovered in space in front of us, while Kraftwerk's staccato rhythms were very precise and forceful. As the Niagara 1000 is a 15 amp device we used it with one of Audioquest's Thunder 15A mains leads. Audioquest make a huge range of mains cables from the humble, but very effective, NRG range to the very high end Dragon. We have really been very impressed with this range from Audioquest. Why not come in and see what some help with the mains could do for your Hi-Fi system? Try it in store and then perhaps try it for a few days in the comfort of your home using our home loan service. Wired for Sound! Choosing The Right Cable Can Make All The Difference! The interconnect cable is very often an afterthought when buying a Hi-Fi system. Sometimes taken for granted or even forgotten about altogether! A good interconnect can make a system sound fantastic, just as easily as a ropey one can ruin the sound completely! This overlooked gem in the Rega range is quite possibly one of the world's best kept secrets along with the Hapsburg Napkin Fold, the Worcester Sauce recipe and the answer to Fermat's Last Theorem!! Well I think it's time that one of these secrets was revealed and the only one I know anything about is the Rega Couple phono to phone analogue interconnect, so here goes as we attempt to tell the whole world (well the Audio T Blog readers) what this cable can do. Here at Audio T Cheltenham we have been trying, testing and listening to phono to phono leads for rather longer than it took for life to crawl up the beaches from the primordial oceans in the days before even the dinosaurs had ancestors. We have tried the good the bad and the ugly and have learned how to recognise a gem when we hear it and this one really is flawless. Obviously it works wonderfully in a Rega system. Whether it is being used with a Rega Apollo CD player and Rega Brio integrated amplifier or going further up the range with the Rega Saturn CD Player + DAC or the Rega Elicit R integrated amplifier, it always sounds great. So a very flexible (in both senses) cable then! We always keep coming back to the Rega Couple as the phono lead of choice to use in our main demo systems in store and to those doubters who say that cables do not make any difference we say come and try this one and you will be converted. Build quality is excellent and even has locking phono plugs for a better connection and to make it less likely that the plugs will be accidentally knocked out. Conductors are full of top notch copper of the high purity type and it also uses Rega's own design of gold plated plugs the signal pin and screening clamp of which are joint free which helps to keep the music signal pure. Choose a well recorded album, (preferably on vinyl of course) such as Radiohead's latest wonderful thing, A Moon shaped Pool - this one happens to be a white vinyl copy.....pick a track....could be any of them because they are all great! When played using a lower prices cable (better not say which) and then comparing the same track using the Rega couple the immediate impression is that the sound stage now has much greater depth and width. Sounds now come from further left and right of the soundstage and the loudspeaker cabinets just disappear! Rhythms have a greater propulsion, bass is tighter and deeper and it is now much easier to follow all the music and the vocals at the same time. The vocals have also now become more distinct and all the tiny inflections in Thom Yorke's voice now come through....... spine tingling stuff!! If you are of the Green persuasion you may be pleased to know that the packing is 100% recyclable. Remember though ...... a phono cable will not improve the signal, it just makes certain that you do not lose information between components! Yes there are better phono to phono leads out there in the big wide wacky wonderful world but that next jump up takes you up to about £200 and that's a whole other blog! The price of the Rega Couple is £126 for a one metre pair, but remember if you are buying a new system, not only will we make you a cup of tea or coffee, we will do you a bit of a deal on that price too!! Now it's time to blog off! New Linn Lingo 4 Motor And Power Supply For Linn Sondek LP12 Turntable. Linn recently introduced the Lingo 4 motor and power supply as an upgrade over the previous Lingo 3 for the Linn Sondek LP12 turntable. There are three power supply options for the LP12. Majik, Lingo and Radikal power supplies are modular and can be fitted as upgrades. Follow the LP12 upgrade hierarchy of bearing, motor and power supply, sub chassis, tonearm, then cartridge for best performance. The Lingo is the first improvement to make on a Majik LP12, providing a clear upgrade from the internal Majik power supply and previous Lingo models. The Akurate LP12 is the middle of three standard LP12 configurations and comes complete with Lingo, Kore sub chassis, Akito tonearm and Krystal cartridge. The new Lingo is a major upgrade to deliver even better sound from your vinyl, thanks to the addition of ground-breaking technology derived from the extraordinary Radikal power supply that is standard on the best LP12 Klimax configuration. Join Julian, Paul and John in the Brighton store to explore the Linn Lingo in detail. Please contact us to arrange a demonstration. Rega have been pushing the boundaries of cartridge design for a good number of years, and none more so than the moving coil type. The Rega Apheta was the first of these in 2005, and that was re-worked and improved when the Apheta 2 was introduced in 2014. The top of the range Aphelion followed in 2015 and demonstrated just how far Rega had progressed the design and manufacture in this highly specialised discipline. All these turntable cartridges are manufactured by Rega at their UK facility in Southend-on-Sea which is quite an accomplishment. The Ania is the new addition to the moving coil range which opens up ownership due to the wider compatibility with tonearms and turntables, and of course its price, which offers great value and exceptional sound for the money. Indeed the Rega Planar 3 combines very well with the Ania, and as you go up through the Rega turntable range greater musical delights become apparent. Rega moving coil cartridges are the low output type and require a moving coil phono stage. It just so happens that Rega are also introducing the Fono MC that is an obvious partner, although other MC stages will work. The newly announced Rega Planar 6 completes the perfect package of Planar 6 (inc Neo PSU), the Ania MC cartridge and the recently released Fono MC stage. The Ania and Fono MC are already the beneficiaries of a fine review by Jason Kennedy in the-ear.net where he extols the virtue of their performance partnered with the Rega RP8 turntable. We have the Ania, Apheta 2 and Aphelion on demonstration and expect the Fono MC in mid July and the new Planar 6 around the end of July. So, give us a call to hear the combination of your choice, and we will arrange that for you.